It’s not very often that two new iPhone models are upstaged at their own launch, but that’s exactly what happened at Apple’s September event this year. The iPhone X was the star of the show, the cool new kid everyone wanted to hang out with, while the iPhone 8 and iPhone 8 Plus were relegated to the role of the designated driver – boring, reliable, the one you know will be there once you are done partying with your new friends. That was certainly the case at the hands-on area post the launch event at the Steve Jobs Theatre, where everyone stood in line just to spend some time with the iPhone X, while most iPhone 8 and iPhone 8 Plus units waited for an audience. But as quickly as it came, the cool new thing was gone, not to be seen again until November. Having seen the one with the X-factor, it seems not everyone is excited at that prospect of getting reunited with their ‘boring’ old friends. If there’s one thing that being in your 30s teaches you, it’s that ‘boring’ has a lot going for it. You learn to value familiarity over the latest trend and appreciate the reliability that comes with the tried and tested. Have doubts about Face ID on the iPhone X? Touch ID on the iPhone 8 and iPhone 8 Plus works great as always. Can’t get your head around the ‘notch’? No such thing on the ‘standard’ models. It’s this familiarity and reliability that these two models hope to appeal to, though Apple wouldn’t want the ‘boring’ tag anywhere near the duo, even if we frequently use the word as a compliment. Let’s forget about the iPhone X for a bit and see how the other two new iPhone models fare in a world where their sibling doesn’t exist. Are they compelling enough upgrades in their own right? Let’s find out. From the front, the iPhone 8 and iPhone 8 Plus are practically indistinguishable from their predecessors. Virtually everyone we showed our review units to opened with “Oh, it looks just like the [iPhone] 7” before we asked them to turn them around and look at the all-glass backs. That’s right, the iPhone 8 and iPhone 8 Plus are all-glass on the front and the back, a throwback to the design last seen in the iPhone 4S. Apple says it has used “the most durable glass ever in a smartphone”, a claim that millions will no doubt put to the test in everyday life in the days to come. During the couple of weeks that we’ve spent with these phones, we – accidentally, we promise – managed to drop them once each. First, the iPhone 8, face down, from a coffee table, and then the iPhone 8 Plus from a height of about four feet. While the iPhone 8 escaped unhurt, its bigger sibling landed on tiles on one of its corners and had a little abrasion to show for it afterwards – a stark reminder as to why most people choose to cover their precious phones in cases. While on the subject, though the iPhone 8 and iPhone 8 Plus are marginally bigger than their predecessors, we had no problem fitting our Apple leather cases from the iPhone 7 and iPhone 7 Plus onto them. Most existing third-party cases designed for the older iPhone models should fit just fine as well. At 148 grams, the iPhone 8 is the heaviest non-Plus iPhone to date, while the iPhone 8 Plus crosses the 200g mark. The extra weight would be noticeable if you used an iPhone 7 or iPhone 7 Plus without a case, but if you are someone who changes your case quite often, you are probably used to the overall weight fluctuating slightly and are unlikely to notice these differences. Still, it’s interesting to see a company obsessed with ‘thin and light’ move in the opposite direction with two of its marquee products. If showing the world you have the latest and greatest iPhone (we told you to forget about the iPhone X, remember?) is important to you, hiding your iPhone 8 or iPhone 8 Plus in a non-transparent case would not be the best idea. As we said earlier, the front is virtually identical to that of the previous generation iPhone models, so the only visible difference is in the back. From five (not counting the Product Red) colour options in the previous generation – Rose Gold, Gold, Silver, Black, and Jet Black – we are down to three – Gold, Silver, and Space Grey. The Gold finish on the iPhone 8 and iPhone 8 Plus looks like an amalgamation of the Rose Gold and Gold colours seen previously. 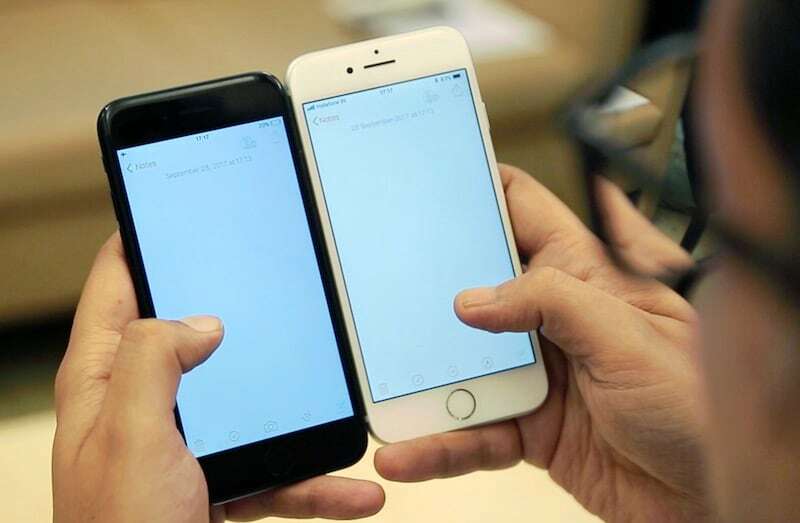 Silver is essentially white, and Space Grey is black. The latter is the only option that’s black on the front, while the other two have white bezels, like in previous years. Colours are largely a personal choice, though we have to say we will miss the Jet Black finish, despite its well-documented tendency to get scuffed up. The nearly-all-glass body means that all iPhone models offer excellent grip, and are unlikely to slip out of your hands. In the two weeks that we spent with the iPhone 8 and iPhone 8 Plus, we didn’t see any scratches or scuff marks resulting from being put into and taken out of pockets, or being stored with other objects in our bag. In the box you get Lightning EarPods, a Lightning to 3.5mm adapter, a USB Type-A to Lightning cable, and a 5W charger (more on this later), apart from the phone itself, and some literature. There’s no Type-C to Lightning cable, which means you cannot directly connect Apple’s flagship phone to its flagship laptops without buying additional cables or dongles from Apple or third parties. There’s no change in the size of the displays on the iPhone 8 or the iPhone 8 Plus compared to their predecessors, and, indeed, the screens have the same resolution, brightness, and contrast ratios as well. OLED and HDR support are reserved for the iPhone X, so the only improvement here is the addition of True Tone functionality. According to Apple, True Tone technology “uses an advanced four‑channel ambient light sensor to subtly adjust the white balance onscreen to match the colour temperature of the light around you.” If that sounds like a load of jargon, we are here to help. In simple terms, like recent iPad Pro models, additional sensors present in the iPhone 8 and iPhone 8 Plus can detect the quality of light around you, and the phone can tweak the display’s white balance to match. This is designed to reduce eye strain and make objects on screen look “as natural as on a printed page”. In terms of real-world experience, perhaps the most significant word in the previous paragraph is “subtly”. The presence of True Tone – a setting that is turned on by default, but can be switched off if you really care about colour accuracy – is unlikely to be noticed by most users. 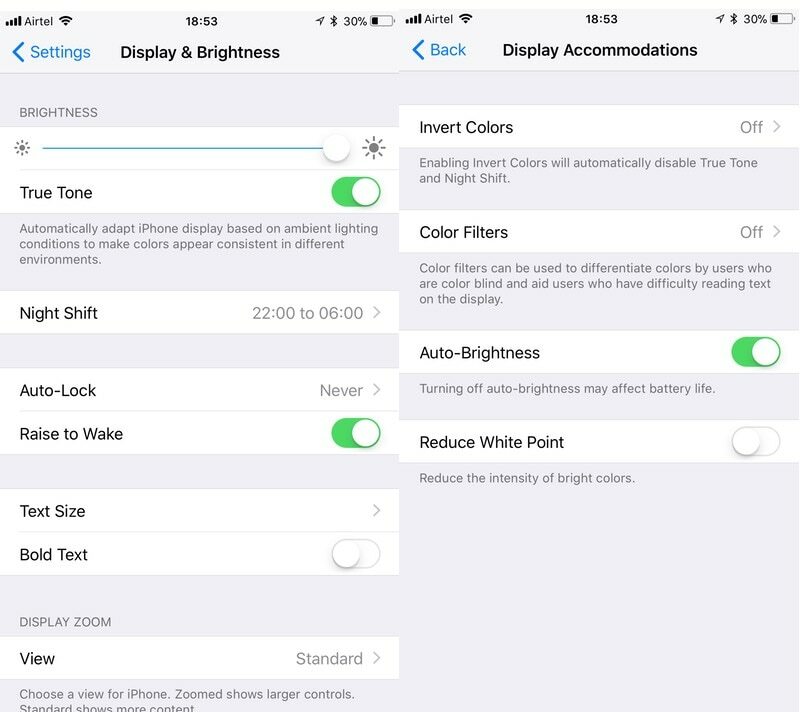 The effect is nowhere as dramatic as turning on Night Shift, which alters the tone of the display and cuts blue light emission to reduce eye strain in a very visible way, and was introduced in iOS 9.3. Most users probably even won’t notice (which, as Apple will tell you, is a good thing) True Tone’s impact until they see their phone side by side with one that doesn’t have the setting enabled. You will no longer find the Auto-Brightness option under Display settings. Turned on by default, this option is instead available under Display Accommodations in Accessibility settings, a hint by Apple that most users shouldn’t bother toggling it on an everyday basis. iOS 11 even warns you that turning auto brightness off may have an impact on battery life. While the iPhone 8 and iPhone 8 Plus might not look very different from the outside, there are big changes on the inside. All three new iPhone models – okay, we promise no reminders that the iPhone X exists after this – are powered by Apple’s brand new A11 Bionic chip. In our review of the iPhone 7 and iPhone 7 Plus we noted how Apple has established itself as a leader in the mobile SoC space, and how both phones were streets ahead of the competition in terms of raw performance at the time of their release. The iPhone 8 and iPhone 8 Plus continue this tradition, and in some ways kick things up a notch higher. 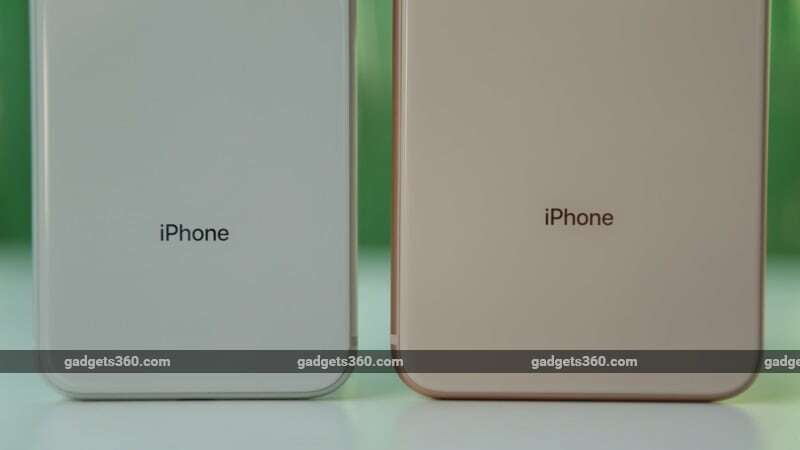 The Apple A10 Fusion inside the previous-generation iPhone models was a quad-core chip with two high-performance cores and two energy-efficient ones, but only one pair could be active at a time. The A11 Bionic, on the other hand, has six cores – four efficient cores that are up to 70 percent faster than ones on the A10, and two performance cores that are up to 25 percent faster – making it Apple’s first hexa-core chip. More importantly, the A11 is capable of running all six at the same time. This means the Apple A11 Bionic absolutely smokes the opposition, especially when it comes to multi-threaded tasks that can scale to multiple cores. In the Geekbench multi-core test, for example, the iPhone 8 Plus scored more than 55 percent higher than the OnePlus 5, the phone that had scored the highest before now, and around 75 percent higher than the iPhone 7 Plus. In fact, its Geekbench multi-core score of 10,386 is higher than that of many laptops out there. For the first time, an iOS device features an Apple-designed GPU. Given the CPU performance lead that Apple established with the A-series by moving chip design in-house, we’ll be closely watching what the company has to offer in this department. The A11 Bionic features a new Apple‑designed three‑core integrated GPU that delivers a ‘paltry’ 30 percent performance gain over the A10 Fusion. All this power means that the iPhone 8 and iPhone 8 Plus can handle everything you throw at them with ease. Everyday tasks are smooth, and everything feels really snappy, especially on the smaller iPhone. We experienced a few niggles during the initial days of our review period, but the iOS 11.0.1 update seems to have addressed all of them. We’ve covered iOS 11 in depth elsewhere on Gadgets 360, so we won’t repeat ourselves here, but talk about a couple of other interesting new features instead. Perhaps the first thing you’ll notice when setting up your new iPhone is that you now have the option to use Quick Start to, well, quickly set up your device. Just hold your new iPhone (or iPad running iOS 11) next to another recent iOS device, and after ‘pairing’ the two, some of your settings like your Apple ID are automatically transferred to the new one. It will also ‘inherit’ your old device’s passcode. Remember that this step just copies some of the settings from the old device to the new one – you still get to choose whether you want to restore apps and data from an iCloud/ iTunes backup or set this device up as new. 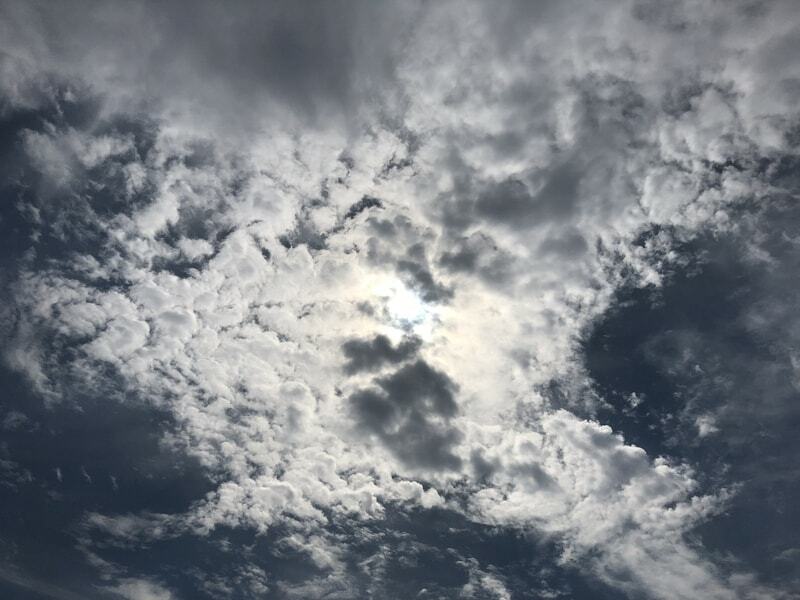 In our experience, Quick Start saved a couple of steps during the setup process, and the post-restore experience wasn’t that different compared to a ‘regular’ restore from an iCloud backup. We still had to enter passwords and set up email accounts, etc, in third-party apps. While older iOS devices do support ARKit – Apple’s framework for augmented reality games and apps – the latest iPhone models truly shine when it comes to bridging the digital and physical worlds. Apple says the cameras on the new iPhone models are “individually calibrated” with new gyroscopes and accelerometers to enable more accurate motion tracking than the older iPhone models. 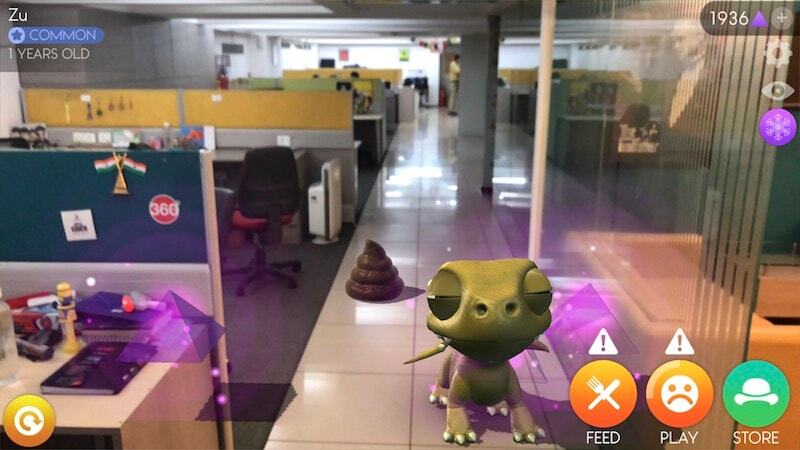 The A11 Bionic chip is faster at things like world tracking and scene recognition, and the new image signal processor (ISP) is capable of real-time lighting estimation when using AR apps. Sadly, iOS 11 does little to improve the experience of using first-party apps in India: Apple Maps is still practically useless here and doesn’t even have basic navigation features, even as Apple is adding lane guidance and more in other regions. This means other apps’ features like Calendar’s ‘time to leave’ alerts for meetings don’t work either. There’s also no sign of Apple Pay, even as rival Samsung’s payment service can be used at virtually every point of sale in the country. 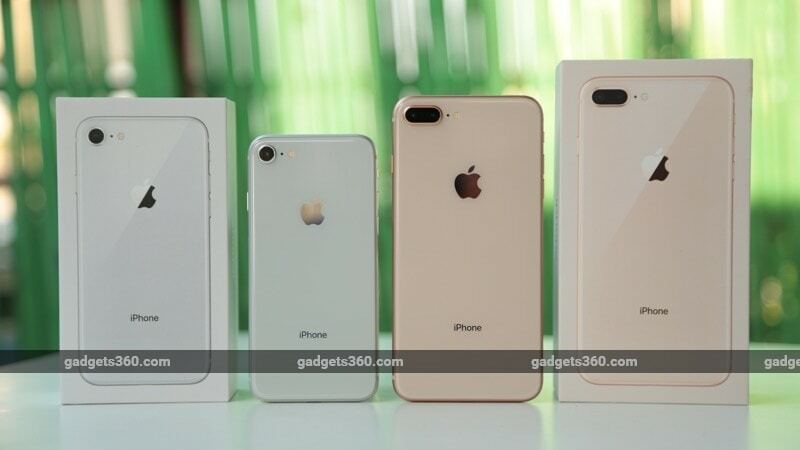 Though Apple doesn’t officially state the amount of RAM that iOS devices ship with, third-party teardowns and benchmark apps have revealed that the iPhone 8 and iPhone 8 Plus have 2GB and 3GB of RAM respectively, figures that are identical to those of their predecessors. What is new, and a welcome change, is the amount of storage that you get on the base model. You now get 64GB of storage on the entry-level iPhone 8 and iPhone 8 Plus (compared to 32GB earlier), and the only step up is to 256GB. What this means is that not only has Apple reduced the number of colours the latest iPhone models are available in from five (ignoring Product Red) to three, but the number of storage variants has also gone down from three to two, reducing the total number of SKUs across the lineup from a whopping 30 (5x3x2) to a more manageable 12 (3x2x2). The entry price of the flagship iPhone lineup has gone up as well – $50 in the US and Rs. 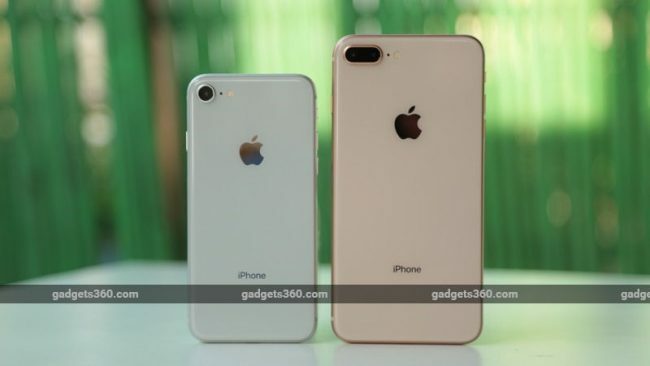 4,000 if you compare the iPhone 8’s launch price with that of the equivalent iPhone 7 a year ago, though it’s worth reminding our readers that MRP of the 32GB iPhone 7 was reduced to Rs. 56,100 after launch, so in a way the Rs. 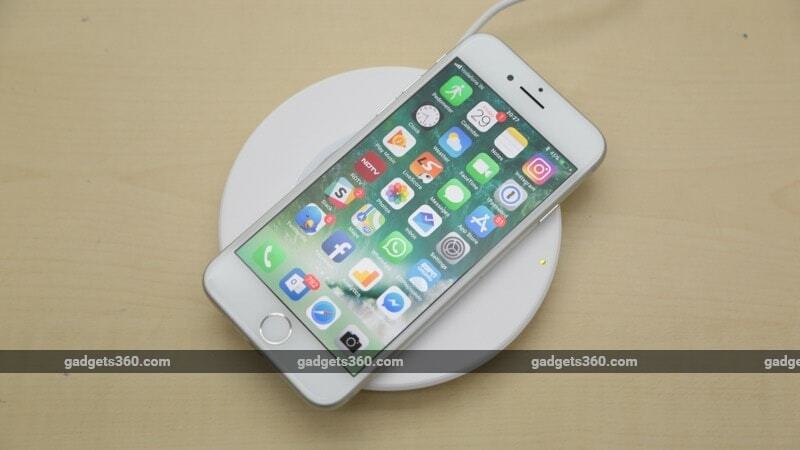 64,000 price tag of the 64GB iPhone 8 is Rs. 8,000 higher than that of its predecessor. Apple says the increase was necessary as its input costs have gone up, a claim that may have some merit as global RAM and flash storage prices have been on the rise recently. Rival Samsung has also launched its flagship smartphones at higher price points this year, so Apple is certainly not alone in this regard. The iPhone 7 and iPhone 7 Plus both had stereo speakers, as do the new models. Apple says the new speakers are up to 25 percent louder and deliver deeper bass, a claim we found to be true during our testing. Like their predecessors, the iPhone 8 and iPhone 8 Plus are IP67 rated for water and dust resistance, which means they can be submerged in depths of 1 metre or less for up to 30 minutes, though, like before, Apple’s warranty won’t cover liquid damage. The glass back of the iPhone 8 and iPhone 8 Plus is not just a design element, it enables an important feature: wireless charging. Apple has adopted the Qi industry standard of wireless charging, which means that though the new iPhone models don’t ship with a wireless charger, you can pick up one of the many third-party Qi-compatible ones out there. The likes of Samsung have supported this standard for a while, so we finally live in a world where the same charger can top up both your iPhone 8 and Galaxy Note 8. If you are new to the world of wireless charging, you need to remember a couple of points: first, it’s not really ‘wireless’. Most wireless charging mechanisms involve a plate of some sort where you can just place your phone and have it begin charging without plugging in any wires, but the plate itself needs to be connected to an outlet via a wire or an adapter. Second, though there have been improvements in the technology recently, wireless charging is still painfully slow. Look ma, no wires! Err… not quite. Apple gave us a 7.5W Belkin wireless charger to test this feature on the new iPhone models with, and it took 24 minutes to move the battery on the iPhone 8 Plus from 20 percent to 30 percent. Apple’s bundled 5W wired adapter charged the same phone from 20 percent to 36 percent in the same time. iPhone models have supported faster charging – using an iPad’s 10W charger, for example – for a while, so it’s baffling why Apple continues to ship such a low-power charger in the box. The iPhone 8 and iPhone 8 Plus support even faster charging using USB Type-C, but you will need to buy an expensive power adapter that is compatible with the USB Type-C Power Delivery specification and a Type-C to Lightning cable just to use this feature. If you already have a current (or previous generation) Apple MacBook, you can use its charger, but you will still need to buy the cable. Using our MacBook Pro’s 78W charger and a third-party Type-C to Lightning cable, we could top up the battery in our iPhone 8 Plus from 20 percent to 51 percent in the same 24 minutes. Having said that, forking out nearly Rs. 70,000 on a phone and then being expected to spend even more to enable what should be standard functionality is classic Apple up-selling that rightly upsets many. In terms of battery life, the experience using the iPhone 8 and iPhone 8 Plus was similar to that with their predecessors: the former will just about manage a day of use if you don’t do a lot of heavy lifting, while the latter will easily get through a day with some juice to spare. In our HD video loop test, the iPhone 8 and iPhone 8 Plus clocked nearly 8.5 hours and 9.5 hours respectively. Camera performance is an area where smartphones have made arguably the biggest improvements in the decade since the original iPhone was launched. From tiny, grainy images in which we could barely recognise ourselves to ones that can be printed on a billboard, and movies that see a theatrical release, the phone camera has come a long way in a relatively short period of time. For most of this journey, Apple has enjoyed the status of having the best camera phone out there, and the company has taken a lot of pride in calling the iPhone the most popular camera in the world. But as we’ve noted in our recent iPhone reviews, this hasn’t necessarily been true for the last couple of generations. Samsung, HTC, and Google (with the HTC-made Pixel) have caught up with – and in some scenarios even surpassed – the iPhone’s camera performance, which means the iPhone 8 and iPhone 8 Plus will need to really up their game to regain the crown. With tight control of hardware as well as software, Apple seems to have done just that. While the camera specifications remain the same in terms of megapixel counts and aperture sizes, Apple says the 12-megapixel primary camera has a larger and faster sensor, a new colour filter, and deeper pixels. As noted earlier, the A11 Bionic chip includes a brand new Apple-designed image signal processor, which, among other things, aims to provide faster autofocus in low light and better HDR photos. All this is backed by enhancements at the OS level. The iPhone 8 and iPhone 8 Plus support the new High Efficiency Image File Format (HEIF) and High Efficiency Video Coding (HEVC) container for storing photos and videos respectively, which, Apple says, reduce the amount of space taken by your media by up to 50 percent. This, obviously, means you can save more photos and videos on your device and in the cloud. HEVC also enables new capabilities like shooting 4K video at 60fps and 1080p at 240fps. If you set up an iPhone 8 or iPhone 8 Plus as a new device, they will save media in the new formats by default. Technically, HEIF is a new file format, and your images are no longer stored as JPGs on the phone. But for the most part, you don’t need to worry about this. When you share photos and videos using others using apps like Facebook, they will automatically be converted to JPG or H.264 respectively, so everyone can see them. If you want, you can have your phone use JPG/ H.264 by default by going to Settings > Camera > Formats and choosing Most Compatible, though you will miss out on the space savings and the ability to shoot 4K/60fps and 1080p/240fps. If you restore your iPhone from an iOS 10 backup, it might have the Most Compatible option selected by default, which means you will not see the additional video shooting modes. You can safely switch to High Efficiency without any problems if you so desire (we recommend that you do). With all that work put in, how do the iPhone 8 and iPhone 8 Plus fare in terms of camera performance in the real world? In daylight, we noticed that the new iPhone models capture the most accurate colours and more details than the likes of the Galaxy Note 8 and HTC U11. In macro shots, again the phones had the best-in-class colour reproduction, but the amount of detail captured was just a fraction less than the HTC U11. Low-light performance is greatly improved compared to that of the iPhone 7 and iPhone 7 Plus, and with good reason. This is one area in which Apple had fallen considerably behind its competitors. While the iPhone 8 and iPhone 8 Plus still don’t quite capture as much detail as the Samsung Galaxy Note 8 and HTC U11 in low-light conditions, their sensors still manage to do a lot better than before. At times, noise is visible when you zoom in, but most people will be perfectly happy with the results. Overall, we believe the iPhone 8 and iPhone 8 Plus are now at par with the likes of the HTC U11 and Galaxy Note 8, but not significantly better than either in any one aspect of still photography other than capturing the most accurate colours (which obviously matters a lot). 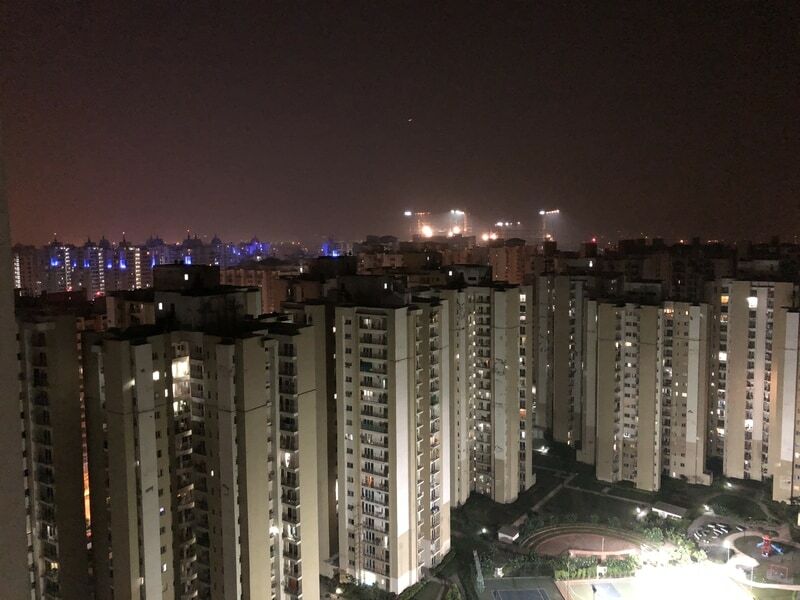 The camera performance of the iPhone 8 and iPhone 8 Plus is identical, though the latter obviously has the ability to use up to 2x optical zoom thanks to the additional telephoto lens. The headline camera feature of the iPhone 7 Plus was its Portrait Mode, which was enabled in a software update that shipped after the phone’s launch. The iPhone 8 Plus retains and greatly improves on this feature, and some of the portraits that we shot with it were just stunning. “DSLR-like” is a marketing phrase often used by companies to sell their phones, but in this case, it wouldn’t be an exaggeration. 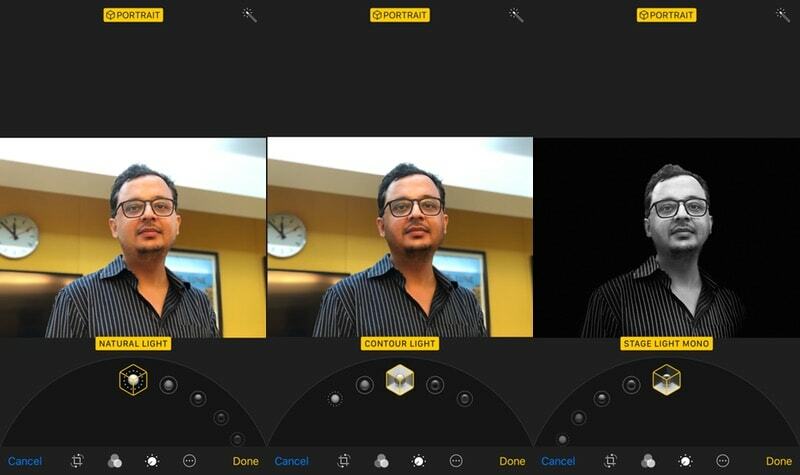 A new feature called Portrait Lighting lets you tweak the light on your face and in the background after you’ve taken a portrait or in real time while composing your frame, but with mixed results. Like the original Portrait Mode, how it performs dependson a lot on the background, the subject, and the lighting in the frame. Apple is labelling this feature as ‘beta’ and just like Portrait Mode, it should get better in the future thanks to machine learning. The iPhone was already our favourite phone for shooting videos with, and the addition of 4K/ 60fps and 1080/ 240fps means that its video capabilities are unmatched. If you shoot a lot of videos with your phone, you don’t need to look beyond the iPhone 8/ iPhone 8 Plus, with the latter supporting 2x optical zoom in video mode as well. We are not into selfies but if you are, the front camera on the new iPhone models packs enough punch to keep you happy. We believe that the best photos are taken with the flash turned off, but we realise most people leave it on the default ‘auto’ option, which means it inevitably triggers in low-light conditions. Apple says the iPhone 8 and iPhone 8 Plus are fitted with “a new quad LED True Tone Flash with Slow Sync” and we tested it against other top-end phones. 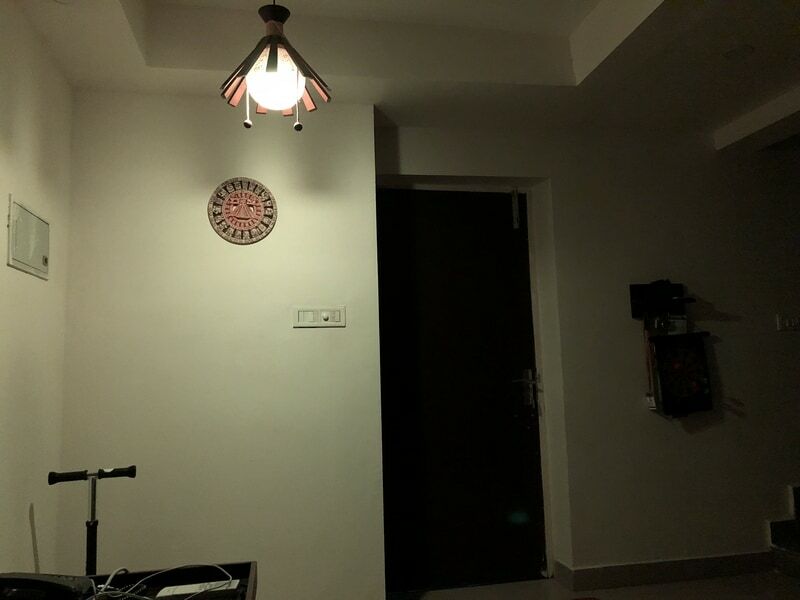 In our tests, we found that although Apple’s flash did not shine the brightest, it did provide the most uniform lighting given the right conditions, without flooding a particular object or spot with light. Apple’s implementation of the ‘selfie flash’ where the screen becomes the flash also came out trumps during our tests. There are some changes to the Camera app as well. You can no longer toggle HDR from within the app – it’s set to Auto by default (and is designed to kick in when the ISP feels it’s needed), but you do have the option to turn it off completely by going to Settings > Camera. Apple has also added some new filters to the app for post (and live) processing of photos, if third-party apps like Instagram are not your thing. Still here? Good, let’s wrap this thing up. Though many have argued that the iPhone 8 and iPhone 8 Plus feel like ’S’ upgrades, our experience shows that in many ways they offer more improvements than the jump from the iPhone 6s to iPhone 7 cycle. 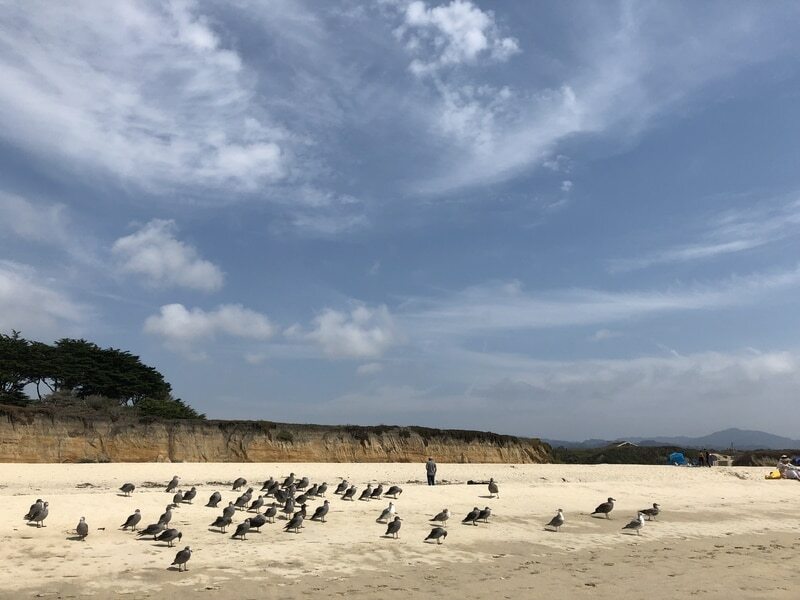 The camera enhancements are significant, bringing Apple back at the same level as the best in the business in some scenarios, while maintaining, or even extending, its lead in others. The iPhone 8 and iPhone 8 Plus are priced at Rs. 64,000 and Rs. 73,000 respectively for the 64GB variants, with a Rs. 13,000 premium on both if you wish to get the 256GB variants. Though there are a couple of other options in this price bracket, the only other phones worth considering at this price point are Samsung’s flagships Galaxy S8+ and Galaxy Note 8 or the Galaxy S8 and the HTC U11, which are marginally cheaper. If you don’t care about the OS, you could pick any one of these devices and safely call yourself the owner of the best smartphone in the world – software and the Note’s S-Pen aside, there’s very little to choose between these phones. In a world where you can buy a smartphone that’s pretty good on all counts for about a quarter of these prices, we believe flagship smartphones continue to offer an experience that’s unmatched, though the number of people who really need this kind of refinement needs to be examined. If you already have an iPhone and money is no object, you could upgrade to the iPhone 8 or iPhone 8 Plus and be extremely happy, but you’d probably want to wait for the iPhone X for even greater bragging rights. Sadly, we don’t know a lot of people for whom money is not a factor when making buying decisions. The cameras would be the best reason for owners of recent iPhone models to upgrade, and the A11 Bionic chip and wireless charging are welcome additions. However, if you have an iPhone 7 (Plus) or even an iPhone 6s (Plus), you have a phone that’s already fast enough for most tasks. Yes, the newest iPhone models will have an edge when it comes to running ARKit apps, but there are no “must-have” uses cases for AR right now. Wireless charging is a convenience that will one day be fast enough to be practical for all occasions, but that day isn’t here yet. And if you really want, there are ways and means of getting it to work with your existing iPhone as well, like by getting a case that supports wireless charging. If you already have an iPhone 7 or iPhone 7 Plus, you can probably skip the iPhone 8 line (unless having the latest and greatest camera is really important to you), and wait to see what Apple does with its lineup next year: maybe the X design language and features will become available at a more accessible price? We’d give the same advice to iPhone 6s line owners who are happy with their phone – if it ain’t broke, don’t go broke buying an upgrade just for the sake of it. But if you have a previous-generation iPhone that’s starting to feel long in the tooth, you will experience significant gains in all departments by upgrading to the new iPhone models. So who are the iPhone 8 and iPhone 8 Plus for, especially in the real world where the prospect of the iPhone X looms large? If you have absolutely no interest in the iPhone X’s design, if you can’t get your head around the idea of the ‘notch’, or can’t afford the phone’s crazy price tag, then you can safely consider its siblings without thinking that you are ‘settling’ for an inferior phone. Yes, you will miss out on what looks like a gorgeous OLED display and other additions like optical image stabilisation on the telephoto lens, but there are plenty of question marks around the iPhone X right now – is Face ID good enough to replace Touch ID? How will the ‘notch’ be incorporated into your favourite applications? We won’t have answers to these questions until we get the chance to test the iPhone X closer to its release in November. The iPhone 8 and iPhone 8 Plus might seem ‘boring’ in comparison, but with their improved cameras, A11 Bionic chip, wireless charging, and a whole lot more, either one of them could happily be your designated driver for the next couple of years – or until your head is turned by the new ‘X’ in town.